A selection of ten excellent compositions inspired by memories and travels around Europe beautifully curated by A Strangely Isolated Place and mastered by Rafael Anton Irisarri. Vinyl collectors were no doubt thrilled with the gorgeous transparent blue treatment and the handcrafted wood packaging of the deluxe edition. A wonderful new series on Flaming Pines which invites selected artists from around the globe to choose and interrogate a site with field recordings and original music. To start off the project, four recordings were simultaneously released by Siavash Amini (Iran), Zenjungle (Greece), Yuco (Japan), and Sound Awakener (Vietnam). Dialog Tapes (original compilation) – Dauw and Eilean Rec. These two very distinctive but compatible labels came up with a scheme to bring their rosters together to create a dual album release consisting of 14 tracks, 7 to be released on each label and each one co-created by a different pairing of artist. 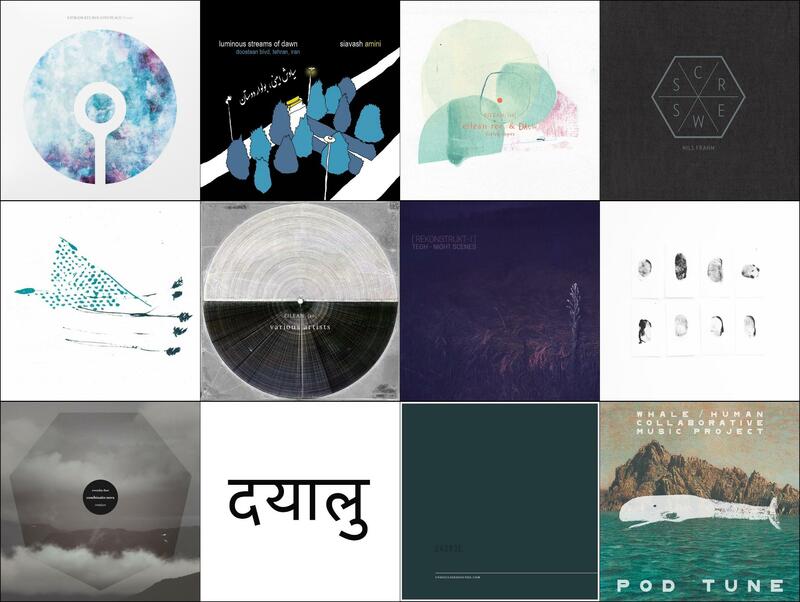 The output is a treasure trove for listeners who appreciate fine spun electroacoustic minimalism. .
Curated from the long running Screws Reworked project, nine lovely tracks hand-picked and sequenced by Frahm himself into an exquisite single album experience featuring artists such as Helios (Keith Kenniff), Ruhe, and Fred Yaddaden. A collection of truly lovely reworks of material from the debut album by Belgian project Illuminine including some live performances by the band.While the original album is very easy on the ear, one could make an argument for these versions being the way the songs were meant to be heard. Eilean 20 (original compilation) – Eilean Rec. There are so many appealing nuances to how Eilean Rec. is conceived and run and this is one of them. The label signs off for 2015 with a compilation containing an original track by each artist who released an album during the course of the year making it both a satisfying retrospective and something altogether new at the same time. The inaugural release of this new label launched by Iranian musicians Siavash Amini, Hesam Ohadi (Idlefon), and Arash Akbari, is not only a superb record in its own right, but it also sets a benchmark for the label’s aesthetic and launches the “Rekonstrukt” series. The source material is a previous year in review selection, the excellent Night Scenes by Tegh. Featured track: ‘Reflections’ by Ian M Hazeldine, Lucy Claire, Tiny Leaves, Beatrice Chaume. This evocative and highly atmospheric compilation sees an eclectic variety of artists reinterpreting tracks from the three album catalog of the enigmatic Everyday Dust including the excellent Multā Nocte with which it was simultaneously released. No surprise there was a lot of excitement around this new net label launch by the respected Headphone Commute music blog. Undisclosed is a series of EP releases in which the artist is anonymous, freeing them to create something unburdened by preconceptions associated with their name and freeing the listener to focus solely on the music. This gives the series a certain engaging unpredictability, but HC hand picks the participants, so you never need to worry that the level of quality and artistry will be anything less than exceptional. The artists associated with this stunning 40+ track compilation read like a who’s who of the genre. – Field Rotation, Machinefabriek, Olan Mill, offthesky, Arovane, The Green Kingdom, Wil Bolton and so many more. Originally released to raise funds toward relief from the earthquake in Nepal, it is now a free download for any who may have missed out. A highly original compilation featuring whale song and music by a globally and musically diverse group of artists. The whale sounds are not superimposed over the music simply to create an atmosphere or mental imagery, but they become a truly collaborative part of each composition. Includes such ambient music luminaries as Loscil, Christina Vantzou, and William Basinksi. Very happy to share it. Thank you for the positive feedback.